Home of the famous Red Sox and Harvard University, Boston is a city that's big on baseball, but even bigger on culture. There's a museum or a historical site to discover round every corner, as well as captivating neighbourhoods to explore and stunning parks and gardens to wander in. Add to that a picturesque waterfront and day-trips to lots of nearby New England scenic spots, and you've got a city with a lot to offer. Thought the Boston Tea Party was all about putting the kettle on? Think again - it played a big part in kick-starting the American Revolutionary War. Meandering for 2.5 miles, the Freedom Trail links the places that helped earn Boston the tag 'Cradle of Modern America' and takes in sites like the city's oldest building, the 1680 house of revolutionary Paul Revere as well as the site of the Boston Massacre - and the 1797 navy ship USS Constitution, moored in the harbour. It's a fascinating way to relive America's path to independence. Walking is one of the best ways to discover the city on Boston holidays, and you can wander the cobblestoned streets of upscale Beacon Hill, lined with elegant townhouses and gas lamps, before exploring the Victorian brownstones of Back Bay. There's plenty of green spaces to enjoy too, and the trees in the Public Garden look spectacular when the Fall colours hit, whilst riding a Swan Boat on the park lagoon is a must. A string of other parks help to make up the city's 'Emerald Necklace'. Once you've walked enough, you can take to the water for a cruise along the Charles River, or head out of town to explore nearby gems like beautiful coastal Cape Ann, or Salem with its tales of witchcraft. One thing's for sure: Boston holidays will leave you spellbound. There's a stack of top-notch museums in this learned city. The Museum of Fine Art has a superb collection including many iconic works, whilst the eye-catching Institute of Contemporary Arts covers the modern end of the market.The Concord Museum tackles Boston's history, whilst the Isabella Stewart Gardiner Museum is famous for its beautiful 'palazzo' setting. Kids will love the interactive Museum of Science. Boston's strong links with American independence also means 4th July is a big deal, and the annual Harborfest climaxes in a spectacular fireworks display over the river, complete with music from the Boston Pops. Also on the river, the Head of the Charles Regatta is the largest in the world and takes place the during the penultimate weekend of October. New Years Eve sees the annual first night Celebration Parade. There's some great food to be had on Boston holidays. North End does authentic Italian; Chinatown serves up Asian specialities; and everywhere is brimful of delicious fresh seafood like lobster, scallops and fried clams. America's oldest restaurant, Ye Olde Union Oyster House, is just across the street from Faneuil Hall market, where you can find eateries and food carts galore. Boston is a college city, which gives it an extra buzz. Two of the most famous, Harvard and Massachusetts Institute of Technology, are based across the river in Cambridge, and are well worth a visit. Sit at a café in busy Harvard Square, bustling with students and professors; admire three centuries' worth of architecture at historic Harvard Yard; and explore some first-class museums. Shopping in Boston is an event in itself. From the Simon Shopping Destination at Copley Place in the historic Back Bay Area of the city, to the world famous 300 year old Faneuil Hall Marketplace, there are plenty of big brands to choose from. You can also browse upscale boutiques in Newbury and Charles Streets or head to Boston’s North End for Italian delicatessens and vintage clothes. For great bargain shopping, head to Wrentham Village Premium Outlets, New England's largest collection of designer outlets with 180 stores. Standing a stately seven stories in Boston's historic Back Bay, 'The Grande Dame' of Boston, this first class hotel has been a landmark of elegance since its gala opening in 1912. Just steps away from the unique galleries and boutiques of Newbury Street, the elegant Shops at Prudential Center and Copley Place this hotel is ideal for travel-enthusiasts of all ages. This award winning upscale hotel is centrally located in downtown Boston. All 500 guestrooms feature Sealy plush mattresses with feather down beds and full bath amenities with Portico products. Guests enjoy a home away from home at this polished downtown oasis. Explore the exciting sights of Boston and then return to the hotel for an inspired night of rest and relaxation. Nine Zero Hotel is a beautiful Boston boutique hotel bringing together everything the discerning traveler seeks. An ideal location in downtown Boston with a personalised service. For the traveler on a budget, this standard hotel offers a blend of economy and comfort in a location convenient to Copley Place, the Museum of Fine Arts, Symphony Hall and more. Located on the Cambridge side of the Charles River, the Royal Sonesta Boston is an upscale hotel offering guests spectacular city views, luxury accommodations and contemporary art. Located in Boston's fashionable Back Bay, this charming hotel is comprised of deluxe guest rooms, a restaurant and lounge, a Starbucks® Coffee and a complete health club. Set a pace that suits you at Residence Inn by Marriott® Boston Downtown Seaport located minutes from the financial district. Boston hotel will provide you with all you need. Combine two centres of American history on this suggested twin centre holiday, one a pulsating, cultural city, the other a bohemian enclave in a spectacular coastal setting. 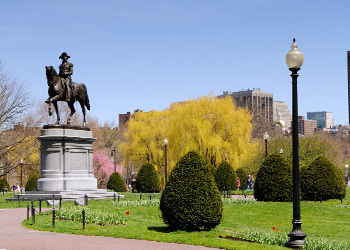 Start in Boston, where there's a museum or a historical site to discover round every corner, as well as captivating neighbourhoods to explore and stunning parks and gardens to wander in. Pick up a car from here and drive south along the Atlantic Coast to Cape Cod where you will have plenty of time to explore this famous corner of New England from your base in Provincetown, where the Pilgrims first landed in 1620. Enjoy a maritime New England holiday, taking you along the stunning coastal roads of Maine and then by historic Windjammer on a 3 night cruise to explore the coast from the sea! Your holiday begins when you fly into Boston and pick up your hire car for a short journey along the coast to the pretty village of Ogunquit. From here, it’s along the beautiful Maine coast to Camden for your 2 night voyage aboard a traditional Windjammer schooner. Returning to land, you’ll head up to Bar Harbor and the stunning Acadia National Park before returning to Boston via Portland, Maine’s funky metropolis and pretty Kennebunkport. Get away from it all and discover the famous resorts of Cape Cod, Martha’s Vineyard and Newport, Rhode Island on this relaxing New England fly drive holiday. Pick up your hire car in Boston and drive down to Falmouth on Cape Cod for a night before catching a ferry across to the celebrity island retreat of Martha’s Vineyard. After two days of beach walks, lighthouses and freshly caught seafood, it’s time to head back to the mainland and visit ‘America’s hometown’ Plymouth before stopping for a couple of nights in elegant Newport. Your holiday ends back in Boston with a few hours to spare before your flight home. For an introduction to the delights of New England, this six state sampler fly drive itinerary is hard to beat. Start in the region’s largest city, Boston before taking to the road and sampling the coastal wonders of Maine, the mountain vistas of New Hampshire, the charming rural scenery of Vermont, the antique shops of Connecticut, the revolutionary history of Massachusetts and the extravagant summer mansions of Rhode Island. Buzzing city life, history, culture, fantastic natural scenery and time for relaxing on the beach – what more could you want from a holiday? A Boston Duck Tour is a wonderful way to get a great look at Boston on land and water. See all the major landmarks, from the gold-domed State House to Bunker Hill, and hear about the long history of the city by your guided ConDUCKtours, as you travel around in a renovated World War II amphibious vehicle. Then splash down into the Charles River for amazing picture views of the Boston and Cambridge skylines. From £37 per person. During this 70-minute tour you’ll enjoy a one-of-a-kind presentation given by current Harvard students who share their insider perspective of college life in Cambridge. You'll see historical buildings as you tour Harvard Yard and Harvard Square, hear stories about the school's history and learn about some famous people who attended the school. From £13 per person. Get your camera ready and explore Boston's Freedom Trail on this guided walking tour. Hear some interesting commentary from your guide, a professional photographer, and learn creative photography tips as you wind your way along the trail travelled by the Patriots in their fight for independence from British rule. From £30 per person. Marvel at the spectacular New England countryside on this scenic fall foliage tour from Boston. The tour takes you for a drive east over gently rolling hills and through small towns in Massachusetts and New Hampshire dotted with age-old taverns, colonial churches, farms and prairies, all featuring a beautiful display of autumn's stunning colours. From £31 per person. Note: This tour is seasonal and only operates from September through October. On this New England summer adventure, escape from Boston for a day and journey to scenic Cape Cod, where sparkling beaches, lighthouses, cottages, sailboats and fishing villages await. In the September and October months, the spectacular colours of the autumn foliage add to this unique experience. From £42 per person. Taxis from Boston Logan International start from $25-$35 per person each way. With a compact downtown area and an efficient public transport network most of Boston’s sights can be visited without a car. Hire a car and explore the surrounding areas. Check out the great selection of dining options, attractions and local excursions available. Care hire is available from £21 per day. Between March and November take a catamaran trip and catch a glimpse of the humpback whale from Stellwagan Bank, the East Coast’s most famous whale watching destination.